The following Case Study is by Pacific Data Systems, a leader in smart monitoring and control systems and ORBCOMM solution provider based in Brisbane, Australia. Download the full Case Study here. MineCo* is a global mining company that specializes in minerals used in building, manufacturing and primary industries. In Australasia, it has many mine sites and plants, some in very remote, hard to reach or fragile locations. One particular mine in Australia is in the tropical North, and is subject to high temperatures, heavy rain and, in monsoon season, the occasional extreme weather. The site itself is also sandy and fragile, yet there is also dense forest with trees over 30 meters high and a steep escarpment to negotiate, which all make getting around quite a challenge. Until recently, it was a requirement for MineCo staff to go to site to take groundwater measurements. According to Senior Hydrogeologist, Sean Finemore*: ‘It was a pretty simple and quick measurement once there, it was just getting there and back that was the problem’. For this MineCo site, groundwater measurements are taken to show that, as a result of the mining operation, neither depletion nor augmentation of levels is taking place. MineCo is serious about workplace safety too and, although sending two people to the site at a time adhered to guidelines, Finemore was aware of the hazards and wanted a better solution: ‘It wasn’t just about terrain or cost, it was about safety. Our guys had come across plenty of snakes over the years, so we needed a better way to collect data without risking our people’. Finemore started to look for alternatives, including direct cabling, and various devices powered by battery or solar power and connected to 3G, 4G or satellite networks. The purpose was to collect and send groundwater data back to MineCo’s data repository, and key requirements for the solution were robustness, reliability and continuous operation with low need for maintenance. Finemore already knew Pacific Data Systems, both as a supplier and developer of smart monitoring devices, so the opportunity to create a new device that could handle automated data transfer in tough remote locations was a practical solution for both. With input from MineCo, the R&D team from Pacific Data Systems developed SatVue, a compact, rugged system that uses ORBCOMM’s satellite technology and the IsatData Pro satellite network to transmit data. The SatVue system is self-sustaining with a built-in solar panel. The satellite terminal is IP67 certified and designed to withstand harsh environments, extreme temperatures and high humidity. As designed, the installed equipment and corresponding services require minimal onsite maintenance and support. SatVue has been in place at MineCo’s site for over six months and, according to Finemore, hasn’t missed a beat. Groundwater data has been regularly and continuously sent to the repository and, as a result, no one has been required to go to site to collect data. While the savings are obvious based on just one device, according to Finemore the potential savings are far greater: ‘If we used SatVue for all of our remote measurements on this site, the savings would be substantial. If we extended it to other sites across Australia to measure groundwater and other parameters like stream chemistry, the return would be impressive’. 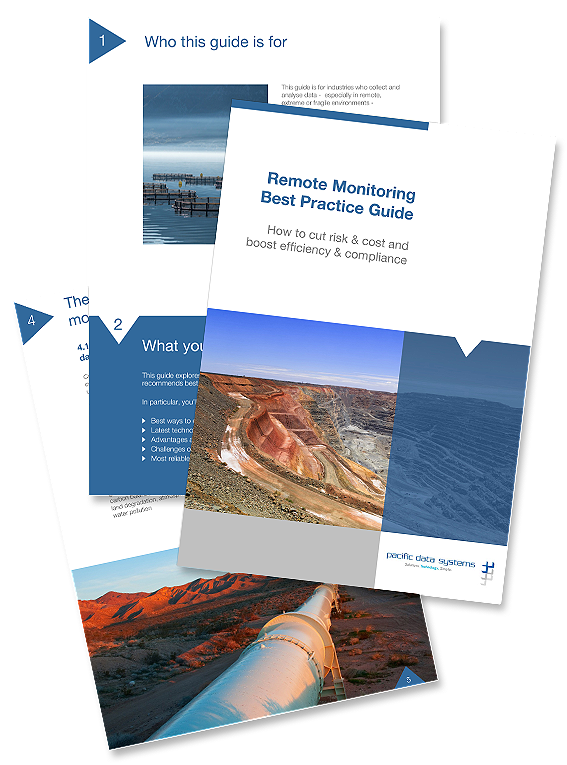 To learn more, download the “Remote Monitoring Best Practice Guide” by Pacific Data Systems, a leader in smart monitoring and control systems based in Brisbane, Australia. The company’s SatVue remote monitoring system combines a rugged, compact ORBCOMM device with smart monitoring technology and reliable satellite communications for environmental monitoring of remote sites. For more information, visit www.satvue.com.au.